Replacement: None. 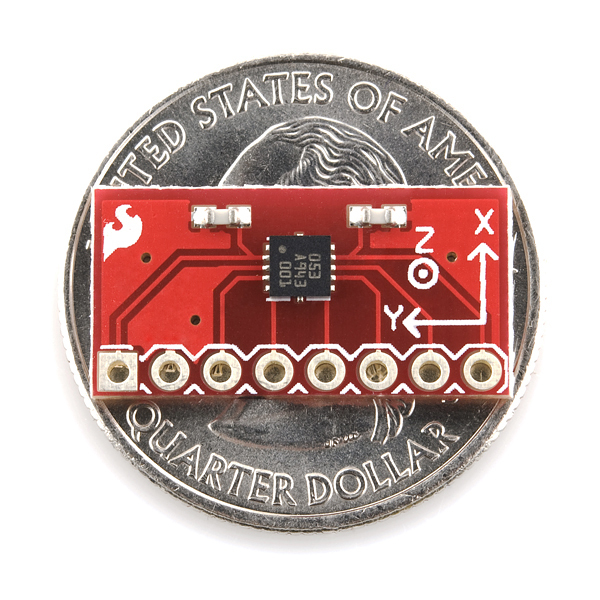 We're not carrying this part anymore, but check out the rest of our accelerometer category. This page is for reference only. I am using the BMA180 with an Arduino Min Pro 3V3 and SPI communications. I found that I had to use SPI Mode 0 (CPOL =0, CPHA = 0), whereas the Bosch Data Sheet implies that Mode 2 (CPOL = 1, CPHA = 0) is required. At first I thought it might be clock frequency/connection related but I tried at both clock rate extremes and it works fine with Mode 0 but not Mode 2. Any similar experiences; I want to understand whether the data sheet is wrong or something else is going on here. I found that Phase = 1 and Pole = 1 works fine. I think the datasheet indicates that sample is on rising clk and clk is normally high. This was a great accelerometer because it is very sensitive at 1g. I cannot find a replacement that has this sensitivity. Does anyone know of one? Thanks. It seems as though I can't change the range on this thing. I write to the reg and then read it back and I can see that it accepted the write but the ADC values are the same. When the sensor is oriented with the +Z pointing up it reads about 1800 on the Z axis and 500 on the X and Y. It doesn't make much sense to me. I looked at several other's code and I'm writing to the same registers in the same order as all the examples I found. I found one other post mentioning the same issue. Anyone have any sample code using Python to convert the values to something usable? Hello people, IÂ´ve been testing this sensor for a while and I still canÂ´t change the acceleration range. I can change the register 0x35 with the data I need but the eeprom is always in the default value after a soft reset. Anyone has any idea please? Thank you very much! the strange "offsets" happen all the time. Its like the value off the Z is moving to the other values. here is plot with the problem Its a 1h log. Yo Sparkfun! Accelerometers can't accurately measure movement unless they are rigidly connected to the thing that is moving. 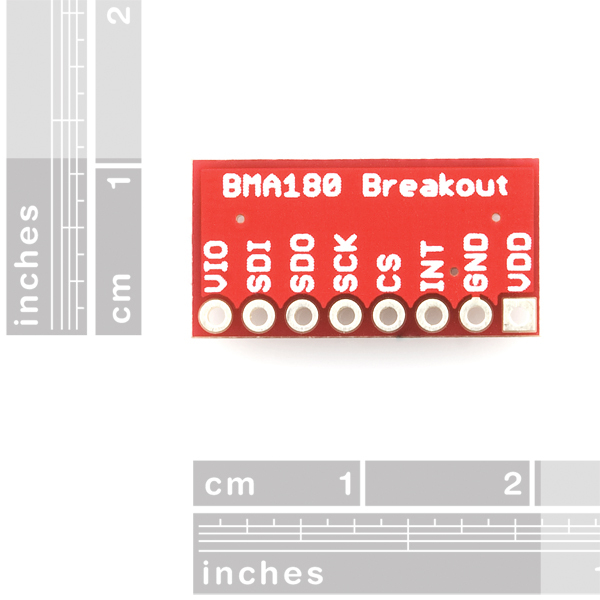 Please put mounting holes on all accel breakout boards! Preferably 4 of them so the accel is not cantilevered! If you plan on using BMA180 with SPI, there is possibility of collision between SPI and I2C. It can be taken care of, though. See this thread. Is it possible to use this device with a Arduino Uno? Is it necessary to use a logic level converter? Mine works fine with my Arduino Uno. I have not had any problems using it on a 5v supply. It also works if you power it from the 3.3v supply. The digital in/out will work just fine with 3v even through they are expecting 5v. I'm having trouble setting BMA180 registers (eg, the range and bandwidth registers at 0x35 and 0x20) using a UBW32 PIC32 board. I can read the version, gain, range, and acceleration values alright (using SPI with control byte with leading bit 1) but after writing (control byte with leading bit 0), a read returns the same value the register had before the write. I'm writing directly into the setting register, not the EEPROM register -- the data sheet says this is read/write, but I can't get the write to work. Any pointers on what I might be doing wrong will be appreciated; thanks in advance. Ok, I got it -- need to set the ctrl_reg0 ee_w bit. With that set the image registers change properly. I am trying to communicate with the BMA180 with SPI. Is there any command I can send that will return a known output so that I can know if I am data correctly. Is it right that you send a 1 followed by 7 bits which are the register number that you want to read? How about the version and chip ID registers? They won't change whereas other ones will. May the measurement range be changed on the fly? say as part of the program? When will this product be in stock again? how to set bma180 so the chip will send 100data every second? do you know what is the setting for hyperterminal? i use 9600bps,8bit,no parity,stopbit1,dataflowcontrol none. btw i want to set hyperterminal on 9600bps,8bit,no parity,stopbit1,dataflowcontrol none. SPI modes 0 and 3 work for me (so I'll use mode 3 so SCK is high when idle, see datasheet). Thanks MUX, mine had the same problem, the address was 0x80 instead of 0x40 with SDO grounded. Any one else got Version register to read out like 0x14 instead of 0x12 as stated in the data sheet. I don't have any problems just did got confused when I was trying to set it up. For the people who speak Spanish. No way! So little stock? I coudn't even order it when I saw the stock notification mail! Are we going to wait another 1 or 2 months for the stocks to arrive again? Any update on availability yet? 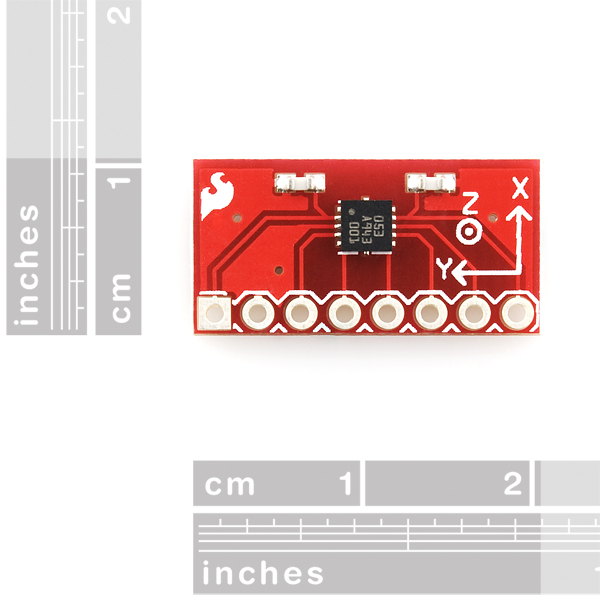 Hi, might anyone have a schematic to show connection of this accel sensor to an Uno and some Arduino example code ? Thanks! My Quadrocopter is anxiously awaiting this board (well, me too :) ). Any update on the shipment of the IC yet? Thanks for any update. Can we have an update on when/if this board will be back in stock? It's hard to say, we are out of stock on the IC and awaiting shipment. Feels like forever waiting for the boards to arrive. I have the BMA180 breakout board going through a logic level converter into an Arduino Mini 04. I am able to communicate with the accelerometer and write changes to the registers but I have not been able to use the interrupt feature. Has anyone had luck triggering interrupts with the BMA180? I am looking to trigger an interrupt on a double tap (any axis), I have set the necessary settings and threshold but I still cannot trigger the interrupt. 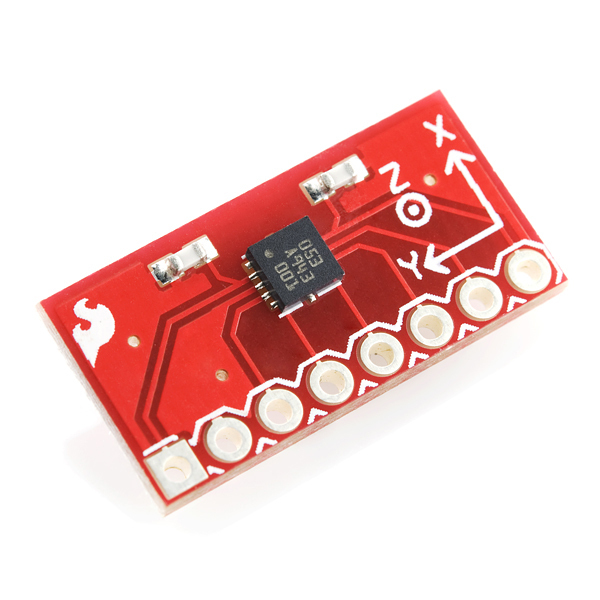 Are there any SPI or I2C wiring examples for using this accelerometer with Duemilanove? The diagrams in the datasheet aren't working for me. A logic level converter should not be used. It makes the readings very noisy. Is there a wiring setup to connect via I2C with PIC18F? Hello, is there any way to interface BMA180 with a pic microcontroller? Does exist any example of code compatible with PIC mcus? Plz, i need answers its pressinggg!! !